The religio-urban life of Ayodhya is attractive. Being the birthplace of Rama, it becomes a rich field of special interest. This book presents its culture in historical perspective. Rama's ancestors who had founded the city are mentioned in the Rgveda. Its remote antiquity is proved also by the OCP which has been found from Srngaverapura, another old town of the region. Both the cities had contacts with each other. Saketa, a part of Ayodhya, was established on the bank of river Sarayu during the sixth century BC. For a long period, Lord Buddha and the Jaina Tirthankaras had made it their dharmaksetra. The Ramayana and the Ayodhya, series of coins tell about the re-emergence of Ayodhya. Saketa was then a big township. The Kusanas were defeated at Ayodhya. Germs of the same national spirit had inspired the Guptas who had made their offensive from there. Some of them had made it their home. 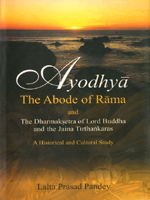 The Pauranika phase of Ayodhya is described in detail. By the time of the Guptas, it had emerged as a great centre of Hindu pilgrimage. Under the influence of the Bhakti cult, during the early medieval period, a number of temples including that of Rama were built there. It continued to flourish in spite of certain odds. Visitors continued to flock there and worship their gods and goddesses. This book enlists the temples and other monuments of Ayodhya and describes its antiquarian prospects.